Building on the success of four previous Capture Arkansas volumes, we are thrilled to announce a new Capture Arkansas hardcover book, Arkansas in Seasons: A Photographic Journey Through Arkansas. This all-new volume will feature photos from Capture Arkansas photographers that highlight what makes Arkansas so unique in all four seasons. Its large format, high-quality printing and unique content make it a collector's item perfectly suited for your coffee table. Some unique challenges: As a part of our effort to compile the best Arkansas photography, we're running challenges specifically for the Arkansas in Seasons book, sponsored by Bedford Camera & Video. We'll publish the people's choice and editors' choice winners from all Arkansas in Seasons challenges, so head over to the challenges page and jump into one of the four Arkansas in Seasons challenges! If you're not yet a registered Capture Arkansas user, sign up for free, here. If you're already a user, go ahead and login. Navigate to the book details page, here, then click the "opt in" button near the top of the page. With that button pressed, all of your previous photo submissions are eligible for inclusion in the Arkansas in Seasons book. Submit new photos (as many as 20 per week) across a wide array of categories, keeping in mind we're specifically looking for photos that showcase the seasons of Arkansas. 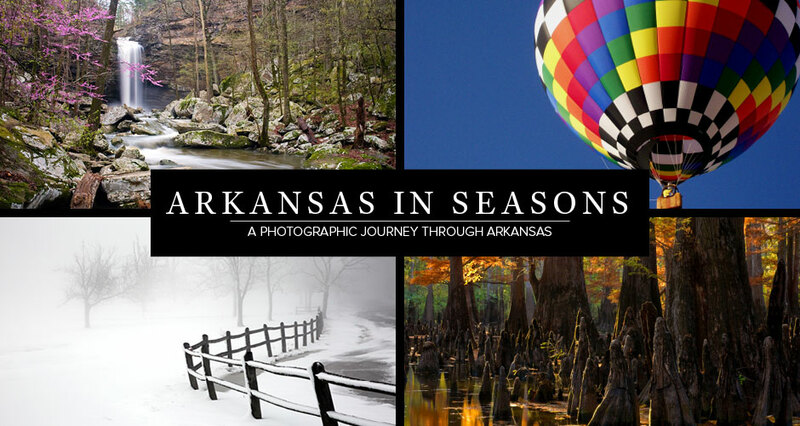 Add your photos to a Arkansas in Seasons challenge, then vote for your favorites! The people's choice and editors' choice winners from each Arkansas in Seasons challenge will be published in the book! We'll also publish photos that fit the Arkansas in Seasons theme outside of challenges, but adding your photos to Arkansas in Seasons challenges will give it a better chance to get votes and be seen by our editors. The Arkansas in Seasons challenges also have some great prizes provided by Bedford Camera & Video! As a side note, keep in mind the voting systems for both the challenges are general Capture Arkansas submissions are aware of how old a photo is, which means older photos with more votes do not have a "head start" on newer photos in fewer votes. In other words, submit new photos as you take them and don't worry about how old or new your photos are. Special discounts: We have two special discount to offer Capture Arkansas users. First, as an introductory offer, the first 100 customers to use coupon code "ca-earlybird" can pre-order the Arkansas in Seasons book for $19.95! That's half off the retail price! Once the first 100 copies are spoken for, we have a never-expiring discount for Capture Arkansas insiders. Use coupon code "caparkinsider" to get the book at a discount at any time. Jump in: If you haven't visited the Capture Arkansas site in a while, now is a great time to jump back in. Get involved with the Arkansas in Seasons book and show us your great photos!